The MC 950 is a small-diaphragm, supercardioid FET condenser mic designed for accurate, transparent sound. It is part of beyerdynamic’s “MC 900” series, which includes the omni MC910 and cardioid MC930. The MC930 was introduced in 2002 (at AES Munich); the 910 and 950 followed late 2008. All three mics share the same capsule, amplifier circuitry, transformerless output, and pad/HPF features. The sole differences are the pickup pattern and frequency-response curves. The supercardioid MC 950 has a less full low-end response than its two sibling mics, and a less-flat high-end response. The 950 shows a -2dB dip from 4kHz-7kHz, and a +2dB lift between 10kHz-15kHz. 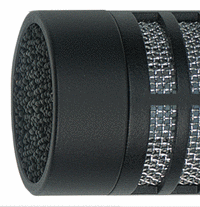 All three mics have a sintered covering rather than the common mesh grille. This cover does not need any supporting infrastructure between itself and the diaphragm. As a result, the diaphragm can be mounted closer to the end of the microphone body, avoiding the reflection problems caused by having the outer circumference of the microphone body extend past the diaphragm. The MC950 is supplied with a mic clip (p/n MKV 9). The pronounced sense of rear rejection in the supercardioid pattern is well suited for minimizing the amount of other sources getting picked up, particularly in a live situation. When used close up and on-axis, the mic provides a fullness and toughness to the low midrange, and as you move in closer, the low bottom end blossoms nicely. I recorded acoustic guitar, upright piano, and vocals, and the key for me was finding the sweet spot, which seemed to be 6 inches to 12 inches away from the source. If you don�t mind showing a little patience and finding the right spot for the MC 950, the results are excellent and competitive with microphones three times the price. The beyerdynamic MC 950 is also known as: MC950.